Had some sort of trauma as a foal, so is not real trusting of people. Prefers women. It is with much regret that I put this mare up for sale, but we need to reduce our broodmare numbers. Foxy is a one of my favorites. 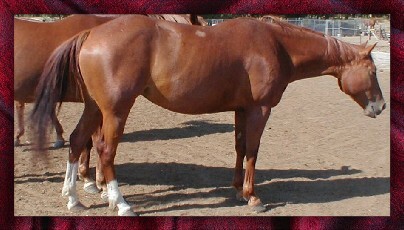 She is a one person horse and has all the class, style, cow, and athletic ability you would ever want in a horse. Purchased as a two year old and rode as a three year old. Been a broodmare ever since. Good mother. Bay Filly born on 4-23-08 by Red Bavarian Hancock. Bay Filly born 5-7-09 by RW Wily Son Fourwood. Sorrel Stud Colt born 5-26-2010 by RW Wily Son Fourwood.